A small bevel gear on a shaft with a sliding bar handle used to tighten and undo the chucks on drilling machines and electric drills. A device that is fitted to the output shaft of a drilling machine or electric drill and other machine tools, to hold a cutting tool. Know as a self centering chuck. The basic form of self centering chuck. Made for precision machines and machining the four jaw is not self centering but can achieve greater accuracy. 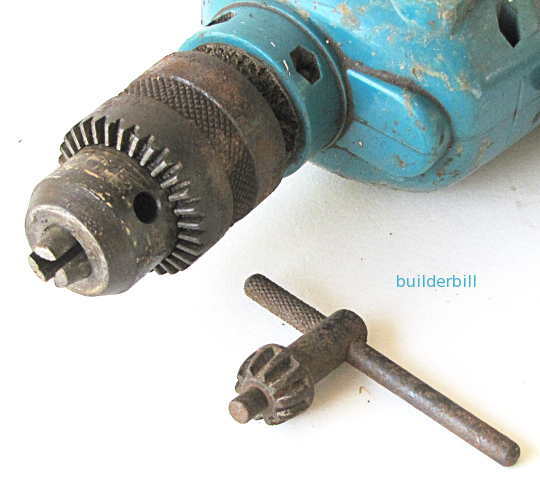 A 12mm three jawed chuck on a power drill and the key that is used to tighten it. The basic mechanism is that of a rack and pinion. The leverage applied to the chuck by the key in this method is significant. Smaller drills are able to use key less chucks and most of the rest of the hand held drills use these three jaw chucks. On larger drill presses etc the grip of an ordinary three jaw chuck is not enough and tapered bits and chucks are used.